Advent calendars are not only for kids—they sweeten the wait for Christmas even for adults. And what could be more amazing than one that’s homemade? Here, we’ll show you 6 ideas to surprise your foodie friends with. Think that Advent calendars only contain sweets? Think again. 1. It's Always Tea Time! A self-made tea Advent calendar will warm every tea lover's heart! Depending on the preference of the recipient, you can choose between loose tea, bags, or a mixture of both. And if you don’t have the right equipment, you can instead pack a nice teapot, matching teacups, a tea strainer, and a nice travel mug to open on Advent Sundays, and thus lighten up the calendar a bit. 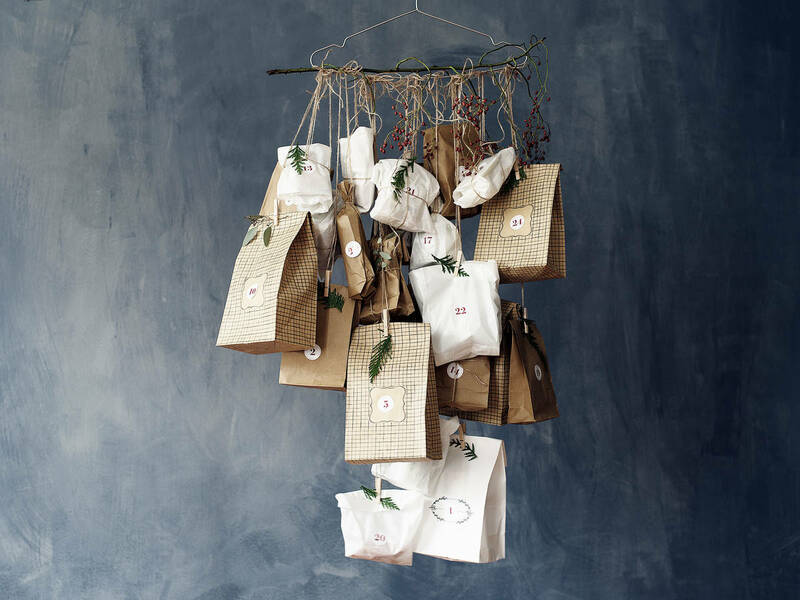 Wrap the tea accessories in wrapping paper or in paper bags, put numbers on each, and attach the individual "doors" to a string. You can also store larger objects in old tin cans and paint them in your color scheme of choice. This craft beer calendar is a great surprise for any beer lover, and it’s perfect as a last-minute gift. You don’t have to do much because the base for this Advent calendar can be found in any corner store. All you need is a beer case with enough space for 24 bottles, solid paper, glue, and some more wrapping paper to pack the beer box, if desired. To make sure the recipient does not get bored, you should choose a different craft beer for each day. All you have to do then is write the number on a piece of paper and stick it on the corresponding bottle. Cheers! If you want to make Christmastime even more beautiful through shared experiences, this coupon Advent calendar is the perfect solution. Of course, it's up to you which types of coupons you want to give away. A delicious Advent brunch, mulled wine and roasted almonds at the Christmas market, a cookie-making fest, or building a gingerbread house together are just a few ideas that will definitely put you in the right Christmas mood. Write down the vouchers on paper, fold them up, and hang them with clothes pins onto a fir branch. A true wine lover will be in seventh heaven upon receiving this advent calendar. Containing 24 selected wines (which of course can also be small bottles), the recipient can test a new wine every day during the pre-Christmas season. With a nice set of wine glasses, a corkscrew, or a wine stopper, you can vary and lighten up the calendar. Simply wrap the bottles in wrapping paper or old newspaper, then tag and number the bottlenecks. Done! We have to admit that this Advent calendar is not completely unselfish, as who wants to drink wine alone? We’re sure you’ll be invited for a glass or two! A homemade spice Advent calendar will send the recipient on a culinary journey of flavors and aromas. If you want to make something special, you can include homemade winter spice blends like Pumpkin Spice or a Chai mix. For the spice Advent calendar, you can use empty canning jars to fill up with your homemade spices. Use labeled stickers or print labels with an embossing device to number them. Of course, you don’t have to commit yourself to a specific topic to create an Advent calendar. You can integrate all the gifts that come to mind for your special someone! With a mix of all of our ideas, nothing stands in the way of a delicious and exciting Advent season! Have you ever given away a homemade advent calendar before—or did you receive one? Tell us in the comments and upload a photo of the calendar!